Enclosed trash cans - just like at McDonalds™ - no more spilled trash on the floor. Sparkling Glitter metal flake finish on the booth backs and chair seats. School logos inlaid into the tabletops to personalize the dining room for the students. Large banners with school mascot and school nickname. Divider panels with built in planters, and a large 8' high tree in the center of the room. The school nickname is routed into the divider walls. We received a wonderful testimonial from the Visalia Unified School District! 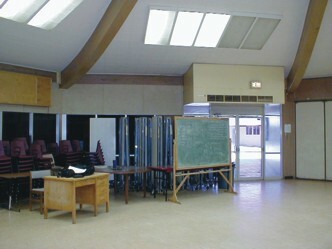 Before: An interesting 8 sided room with very high ceilings that was basically used as a storage area and classroom. 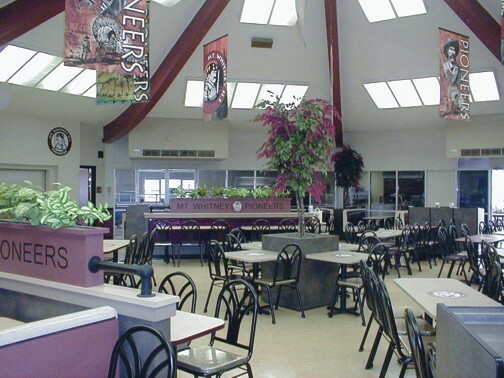 After: We utilize the high ceilings to hang large banners with school mascot and nickname. The design has half wall dividers with planters to segment the large room, and the tree in the middle of the room is a colorful centerpiece.